Meet my assistant, Luisa-Ralph. Poor thing has gender issues, and who wouldn't when you get called Ralph from the beginning of time .... right up until you go to the vets to be spayed and not neutered. She's not really my cat but since she has sought refuge here to avoid unwanted attacks from her puppy brother, I felt it was only fair to give her a girly name more suitable for her majesty. 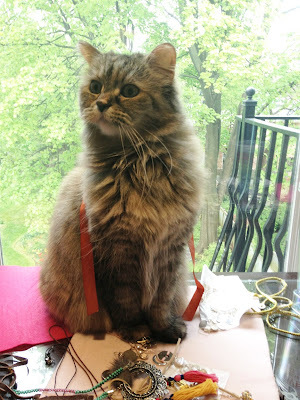 She's rather fond of the jewelry making table as you can see here, and when she decides to help me out, it's nearly impossible to find any work space. Typically she spreads herself out and sunbathes right on top of my trays and supplies, rendering me both useless and smitten.